Never let it be said that coats of arms are boring. As a matter of fact, there are countless possibilities to integrate them into everyday life and, thus, to live the tradition. Signet rings, writing utensils, or dishware with the attached coat of arms are particularly popular. Thereby they are turned into distinguished items. 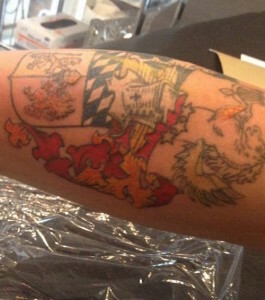 In the following case, however, Mäx Rittner decided to have his coat of arms tattooed on his forearm so he has it always with him. And that is not all! He even won a holiday trip with it! But let us not get ahead of ourselves. 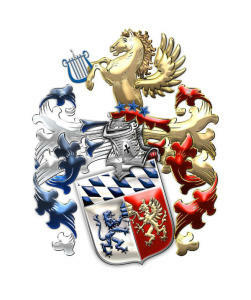 Three years ago, Mäx Rittner decided to commission a coat of arms. He choose symbols that stand for the values of his family, their professions and their origins. When his coat of arms had been completed, he was so proud of it that he wanted to get it as a tattoo. In the first stage, only the black outlines were tattooed, then with a special micro technique the inner contours were added. All in all, it took six sessions until the coat of arms tattoo was realized. The colors had to be tattooed in several separate sessions – one color at a time, otherwise the different color particles might mix inside his skin. When the tattoo was finally finished, Mäx had the chance to take part in a tattoo contest at “Mommy I´m sorry”-tattoo studio. There was a professional photo shooting in which 24 contestants posed for the photographer. 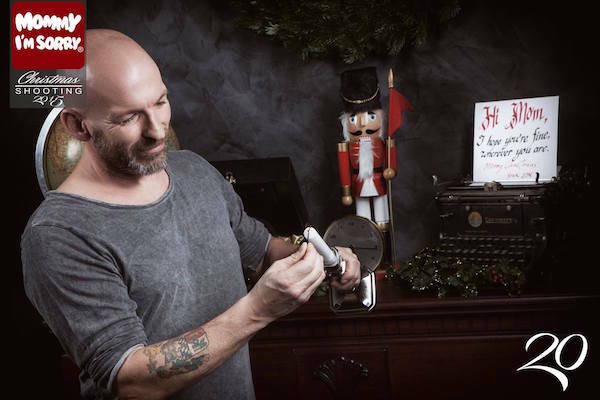 In the pre-Christmas season the tattoo studio posted one picture per day of the 24 contestants on their Facebook page. The picture which atttracted the most likes by the end of the contestwould win. And it was Mäx’s! In the end, Mäx Rittner received 974 likes for his photo and won the first prize – a holiday trip. Even though he does not know what the destination will be, he is overjoyed.